Whether you’re a permanent freelancer, or you have the privilege of being able to work from home occasionally, having a productive home office environment is essential to your creativity. Just like any other working environment, the space needs to be motivational and constructive, so in today’s article, I’m going to give you just a few top tips on how to improve that area in your own home. Who says your walls should just be painted or a place to hang artwork? You can easily turn it into a practical space for thoughts, appointments and schedules for the year. If you have a lot of space to work with, invest in a large white board, and if you’re worried it won’t look very chic, you can always add a funky stencil design around it, such as a speech bubble or a typewriter. If space is limited, you can buy rolls of stick-on white board that can be simply be taken down again. Or, if you’re into that old-school vibe, how about using chalkboard paint over an area instead, and then hanging a vintage frame around the outside? If you have a small space, you can still make room for all your little extras by using clip-on organisers. Or, utilise the under-side of a shelf by fixing jam jar lids to the bottom, and then filling the jars before screwing on. If you want some more cool design ideas like this one, click here. One of the chunkiest items that can make a room look cluttered is the humble printer, but gone are the days when you used to have to keep an entire table free. Now, you can search for a printer that contains the paper and printer processes so that nothing sticks out or up, and you can put it on a bookcase to save on desk space. My top tip for this is to save money on ink as well by buying in bulk from a specialist website like Cartridge People. There are two things that you must not compromise on for an enjoyable working environment, and that’s lighting and seating. Try to incorporate natural light where you can, and when it comes to your chair, invest in a high-quality, ergonomic model that will help to prevent back and neck problems. It’s been proven that adding plants to an office environment helps to boost productivity, stimulating the brain by removing impurities from the air whilst increasing oxygen circulation. Plus, they add a natural, welcoming feeling to a room. If you’re limited on space, terrariums and succulents are a good alternative to the standard pot-plant. You can also personalise them, opting for your own miniature secret garden, or a beach theme with a mixture of coloured sand and shells. 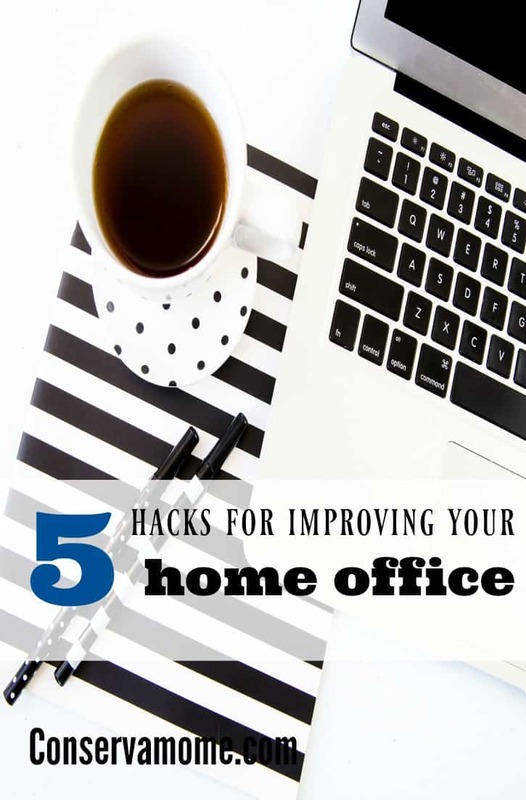 Do you have any more ideas for home office hacks? These are great tips. I need to use some of them in my small office space. I like the printer idea. I think that is great advice. Love the chalkboard paint. I saw chalkboard paint poster board. It would be a good idea, put in a frame, if you didn’t want to or couldn’t paint the wall. Good hacks! I try to keep containers on my desk and on the wall to help me keep tings Idon’t want to get lost. I think we could all use more storage space. Great ideas! I so agree with having the right chair. I let my husband pick out the desk chair and it simply isn’t comfortable for me at all.